Situated in this SOUGHT after town centre location. This 1930s semi detached home offers EXCELLENT accommodation with further POTENTIAL to extend STPP. With a downstairs WC luxury refitted kitchen, four piece bathroom, three double bedrooms, driveway parking and south facing rear gardens in excess of 90 feet. Double glazed walk in bay window to the front, TV point, coving to the ceiling, twin glazed doors to the dining area. Twin glazed doors to the dining area, wood flooring, coving to the ceiling, double glazed sliding doors to the covered balcony. A refitted kitchen with a range of base and eye level storage units, work surface areas with inset single drainer sink unit with mixer tap, fitted four ring gas hob with canopy extractor hood over, built in double oven, plumbing for washing machine and space for fridge freezer, tiled surrounds, wall mounted gas boiler serving central heating and hot water, double glazed windows to both the rear and side. Double glazed window to the front, walk in wardrobe, radiator. 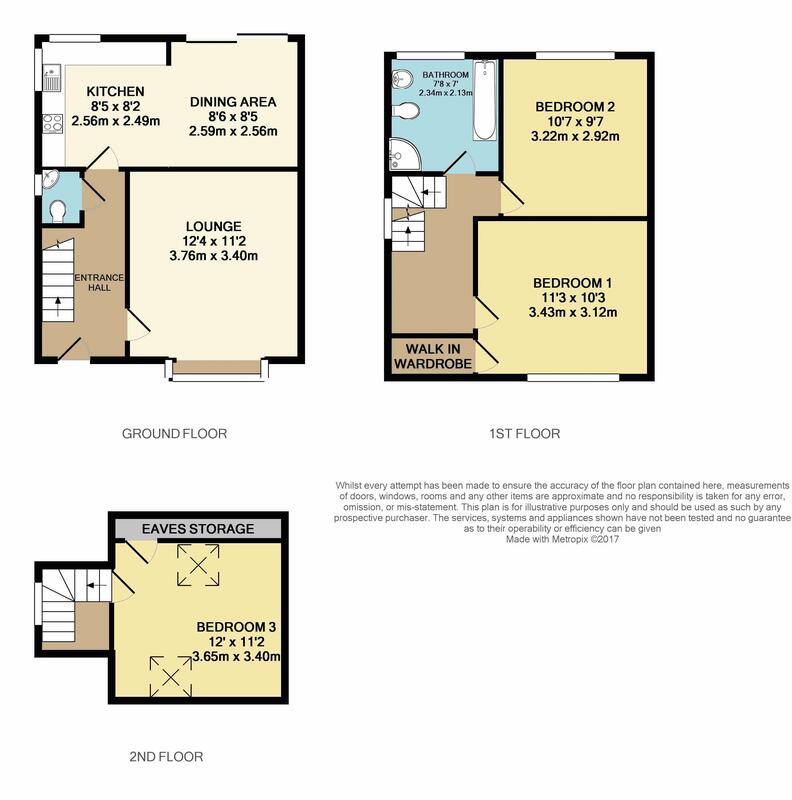 A refitted four piece suite comprising low level WC, pedestal wash hand basin, panel bath with mixer tap and shower over, tiled shower cubicle, tiled surrounds, recessed spot lighting radiator, double glazed window to the rear. Velux windows to both the front and rear aspect, eaves storage space. UPVC double glazed front door set beneath recessed porch opens to. Comprising low level WC, wash hand basin, tiled surrounds, double glazed window to the side. Stairs rise and turn to the first floor, double glazed window to the side. Stairs to the second floor and bedroom three. Gravel double driveway providing off road parking. Laid mainly to driveway with surrounding borders, outside light, step to front door. Covered balcony area to the immediate rear with steps down to the rear garden. Extending to approximately 100 feet in depth the gardens are in need of some cultivation with a south facing aspect, gated side access and storage space below the house with light and power.